The Getty Research Institute has acquired an extraordinarily rare suite of battle prints from about 1793-99. Known as Ping ding Kuoerke zhan tu, or Pictures of the Campaigns against the Gurkhas (i.e., Nepalese), they depict the successful military campaign of the Qianlong Emperor (reigned 1736–1795) against Nepalese warriors. 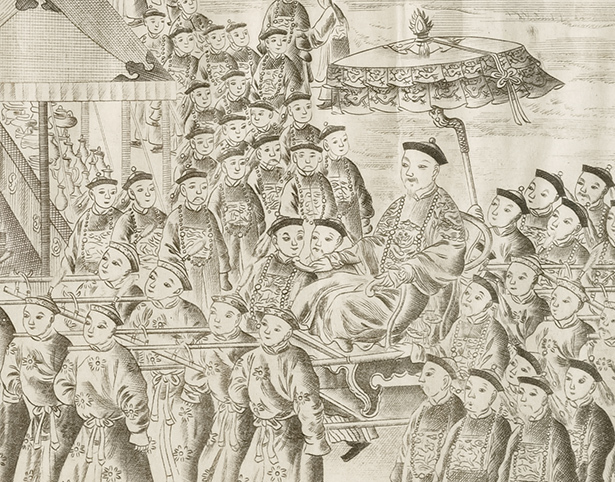 These large-format copper engravings represent the complete set of prints commissioned by the Qianlong Emperor to commemorate the victory in 1792. 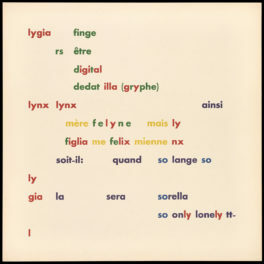 Printed in China, this series is one of seven so-called “Conquest” suites. 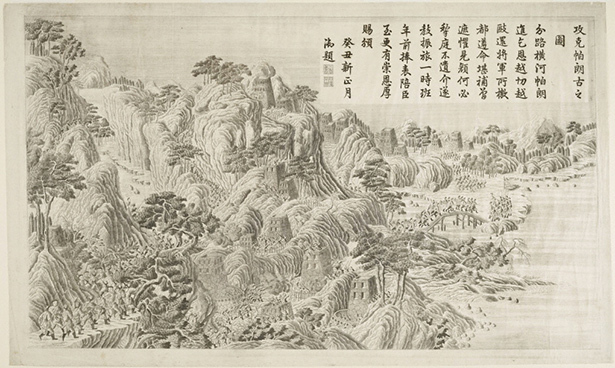 The scenes show dramatic landscapes of undulating mountains that seem to engulf the troops marching and fighting amidst their peaks and valleys. The plate above depicts the victorious emperor being carried toward a yurt in front of the great hall where war heroes are to be honored. The defeated enemy soldiers are grouped to the left, all on their knees. At the top of each print is a poem based on the Qianlong Emperor’s own personal commentary concerning the battles. The Chinese prints were inspired by European battle prints, which had been brought to China by the Jesuits or sent as imperial gifts from European courts. 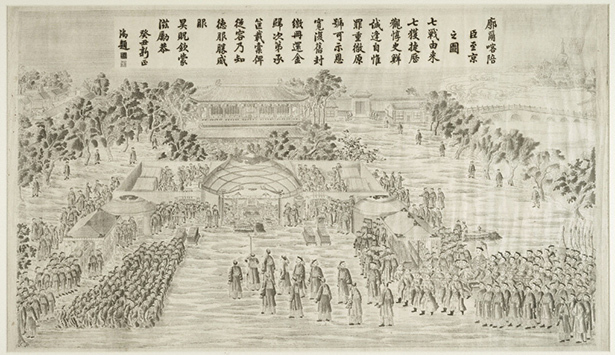 In 1765 the Qianlong Emperor ordered prints commemorating his recent victories against the Zhungar troops. Drawings made by Jesuit court artists, including Giuseppe Castiglione, were sent to Paris to be engraved and printed in the royal workshop of Charles-Nicolas Cochin fils. 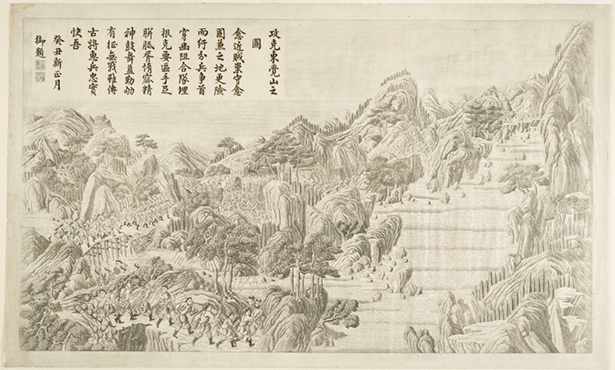 Based on the Qianlong Emperor’s satisfaction with this first series, called the Suite des seize estampes représentant les conquêtes de l’empereur de la Chine (Sixteen prints representing the conquests of the emperor of China), additional suites were commissioned from Chinese artists to celebrate other notable military campaigns during his reign. 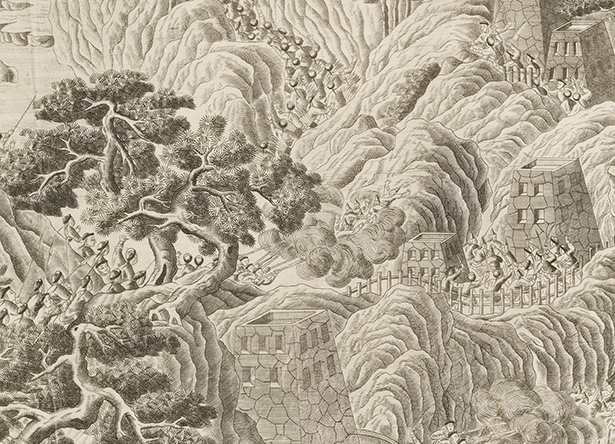 Among the last of Qianlong’s print commissions, produced nearly 30 years after the first series, the Ping ding Kuoerke zhan tu, or Pictures of the Campaigns against the Gurkhas (i.e., Nepalese), are traditional Chinese battle depictions that focus on the landscape. These intricate and stunning prints are in near-perfect original condition, and stand out as highly unusual examples of Chinese images executed with European graphic techniques. 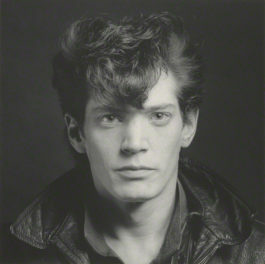 The Getty’s suite is the only complete set in American public collections. At the Research Institute, these understudied prints join a stellar collection of works on paper about China that highlight cross-cultural connections between Europe and China in the early modern era. 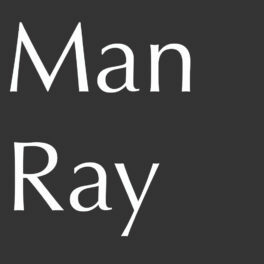 I'm a senior communications specialist at the Getty, working with the Getty Research Institute and the Getty Museum. I'm hopelessly addicted to internet news sites, especially anything to do with art, architecture, and Southern California's cultural scene. I studied art history & critical theory at UCLA and am pretty much only interested football when we're playing the Trojans.